When women band together, they can break down barriers and build each other's confidence. 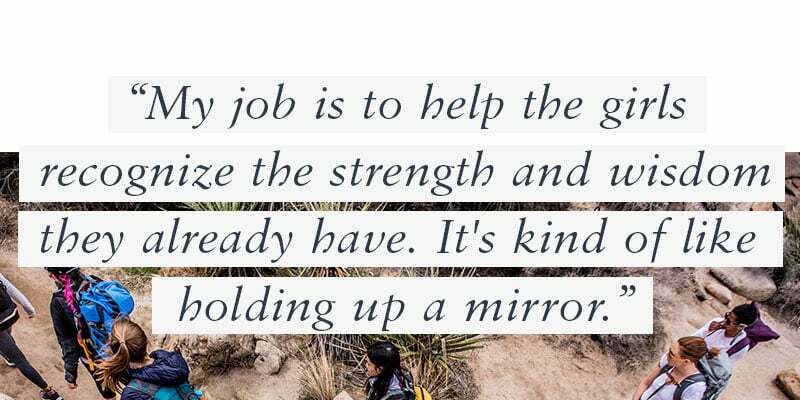 We partnered with Athleta to share how the company worked with nonprofit GirlVentures to co-create a program for girls to express their strengths and encourage them to reach their limitless potential. Quick: where's your phone? Perhaps in your hand, letting you read this story right now. We're constantly connected to our devices these days, which makes it easier to share and stay connected to the people who matter. But thanks to social media updates, text messages, and push notifications, it's sometimes harder to live in the moment. Now imagine living with that constant connection as an adolescent girl. Everywhere you go, you bring the social challenges of growing up with you. It's hard to get a break. That's where GirlVentures comes in. For 20 years, the Bay Area organization has empowered girls and young women to realize their potential through wilderness adventures. 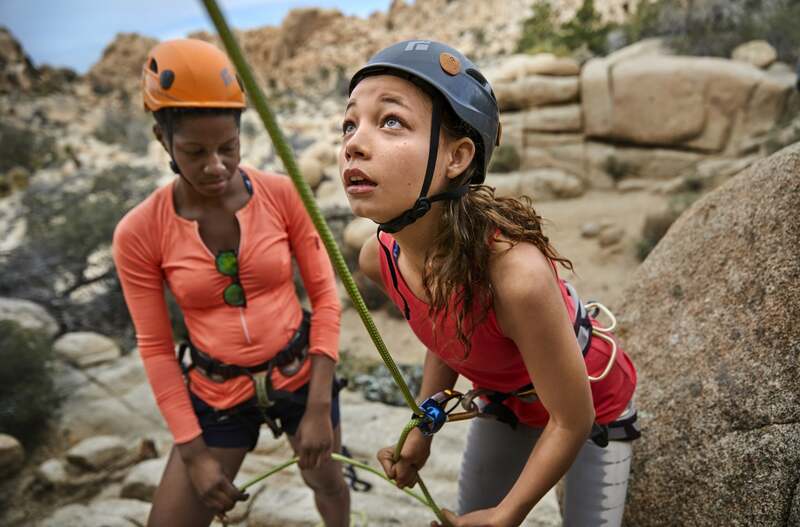 During the organization's various one- or two-week programs, girls backpack, hike, kayak, and rock-climb as they take in the wonders of the California outdoors — and they're always technology free. Through GirlVentures, teens who grew up with phones in their hands can experience the clarity that comes with going off the grid. Cori Coccia, the program director for GirlVentures, says removing social media allows the girls to tap into themselves and the group IRL. Instead of going for the instant gratification that comes with uploading a photo to social media and waiting for the likes and screenshots to come in, the girls have to focus on the people sitting right in front of them. Along with nature, removing technology "is literally the magic ingredient." Taking away distractions allows GirlVentures to bridge the physical world of the outdoors and the emotional world of adolescent girls. Coccia says being in nature creates a space where a group can just be a group. "They're not in their school. They're not in their families with whatever is going on at home. They can take a break from that stuff." While there are other challenges, like climbing a mountain or carrying your backpack up a hill, they're not loaded with everyday baggage. GirlVentures helps girls expand their comfort zones as a group. What inspired GirlVentures? Research demonstrating that girls' self-esteem goes down during middle school. According to one study, self-esteem peaks at 9 years old and by 10th grade, only 14 percent of girls say they are self-confident. "The theory was that this trickled into other areas of life and created a situation where they weren't going to achieve as much or naturally step into leadership roles later in life," Coccia says. The founders of GirlVentures knew that an outdoor program could help meet the needs of girls dealing with a decrease in confidence. 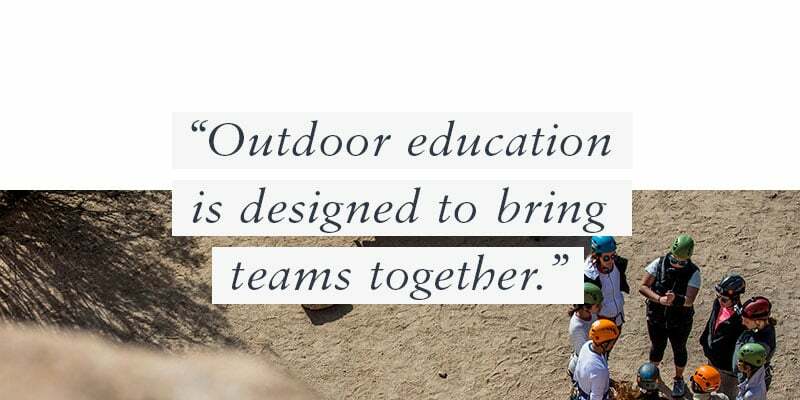 "Outdoor education is designed to bring teams together and help people find a sense of self and a place in the community you're creating for however many days you're out there together," explains Coccia. 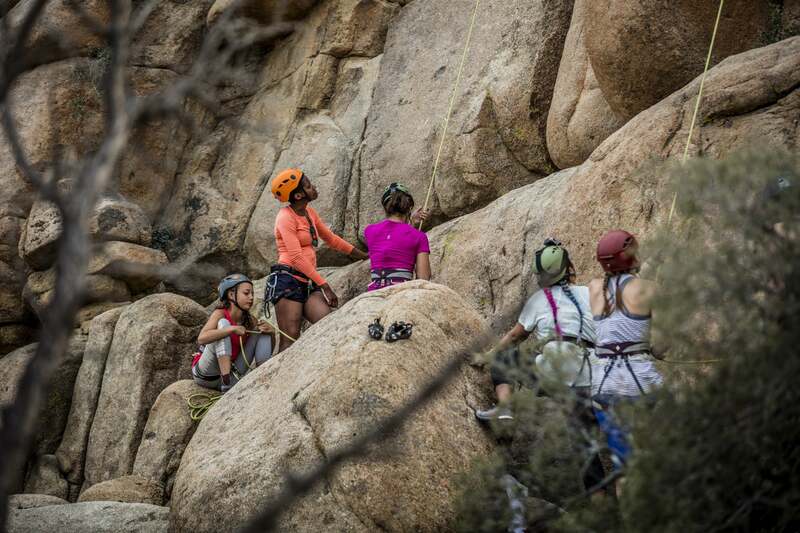 Earlier this year, GirlVentures partnered with Athleta for a five-day trip to Joshua Tree National Park, in line with the activewear brand's The Power of She campaign aimed at highlighting women's empowerment and collaboration. The diverse group of girls and their mentors participated in GirlVentures' signature confidence- and trust-building activities. As Coccia explains, the GirlVentures program isn't about pushing girls to reach their potential; it's about helping them recognize the limitless potential they inherently possess. "My job and the job of our staff is to help the girls recognize the strength and wisdom they already have. It's kind of like holding up a mirror," she explains. Free from distractions of technology and everyday life, girls can embrace physical challenges in nature. Check out the featured Athleta Girl products. 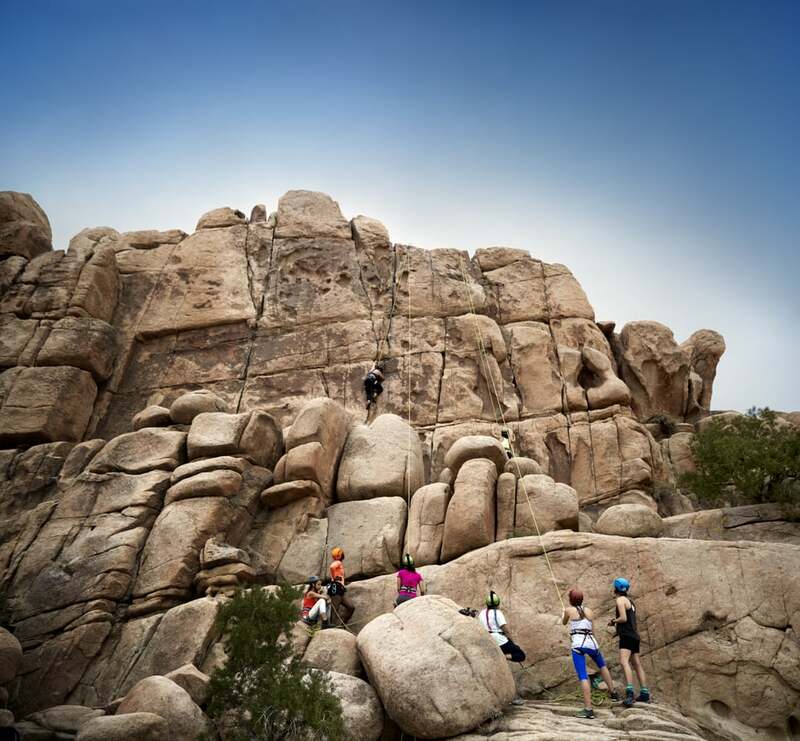 The five-day Joshua Tree program was optimized to do just that. On the first day, the girls met each other and worked out what their leadership roles would be for the week. Coccia calls this the honeymoon stage. "There's an attitude of 'everything's cool, we're just doing this course' — it's really exciting." After preparing dinner and eating together, it's time for bed. On day two, the girls start to leave their comfort zones. There is a morning hike followed by a "grounding" activity, in which the each girl shares her current hopes and fears for the course and life in general. The rest of the day is filled with trust-building activities, like a trust fall. After dinner, the girls have an evening circle around the campfire, which includes a solo moment of reflection and then an exercise Coccia calls "If You Really Knew Me." During this time, each girl must complete the sentence "If you really knew me, you would . . . " by sharing something you can't tell by looking at them. On the Joshua Tree trip, this is when the group really came together. "That was pretty powerful," Coccia recalls. "It opened up a lot of revealing stories. They were more available to be all of themselves in that moment." 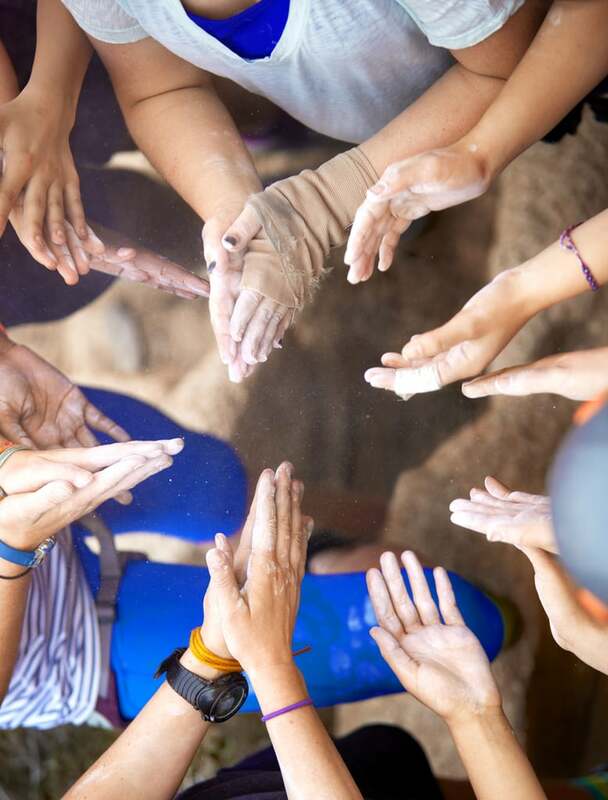 On the third day, the girls got to try rock-climbing — and that included one climb in which each girl was completely blindfolded and reliant on the direction of the group. There were also more honest conversations at campfire. More and more, the activities and discussions were led by the girls themselves. Day four included hiking, climbing, and an exercise called "Masks." Each girl made a paper mask with two sides representing what she wears as an outer mask and what she wears on the inside and rarely shows the world. After creating the masks privately, they shared them with the group. Come the final day, the girls were given a chance to reflect. Each participant wrote a letter to herself, which GirlVentures sent to them six months later. The trip concluded with a "bead circle." Each jewelry bead a girl received represented something she did that required courage. Coccia says courage is a major theme of each GirlVentures program. "It takes courage to step forward and say something you never said before. It takes courage to climb a rock." Both the beads and the letter are meant to be physical reminders of the girls' experiences on the trip. "You can go home, and everything changes very quickly," Coccia admits. "All of a sudden you're back and this whole experience was a dream. It's this reminder. It's a way to tap into all the things you learned." GirlVentures helps girls discover the courage within themselves. Check out Athleta's gear for every outdoor activity. The GirlVentures' model gets results. More than 90 percent of participants say the program empowered them to make a positive personal change. In addition, 92 percent believe their bodies can do more than they initially believed, 92 percent feel more confident to try activities that some people think girls can’t or shouldn’t do, and 91 percent are more likely to be physically active in the future. Through outdoor education, girls can embrace physical challenges in nature. Check out Athleta’s gym and training apparel. With their approach, GirlVentures creates a community of more active, healthy, and confident women who empower each other to realize their limitless potential. Just look to past participants for proof. Chelsea Gelbart 26, did the Project Courage course when she was in middle school. It's a two-week trip that includes sea kayaking, hiking, and camping on the beach. Themes like trust, social justice, identity, and leadership are covered in depth. Today, Gelbart is studying to be a nurse practitioner and says her time with GirlVentures had a lasting impact. She can still remember the first time she loaded a pack twice her size onto her back. "As we traipsed along the jagged coast of Northern California, I witnessed the transformative influence of the outdoors, empowering and bringing together what began as a motley crew of young girls," she recalls. 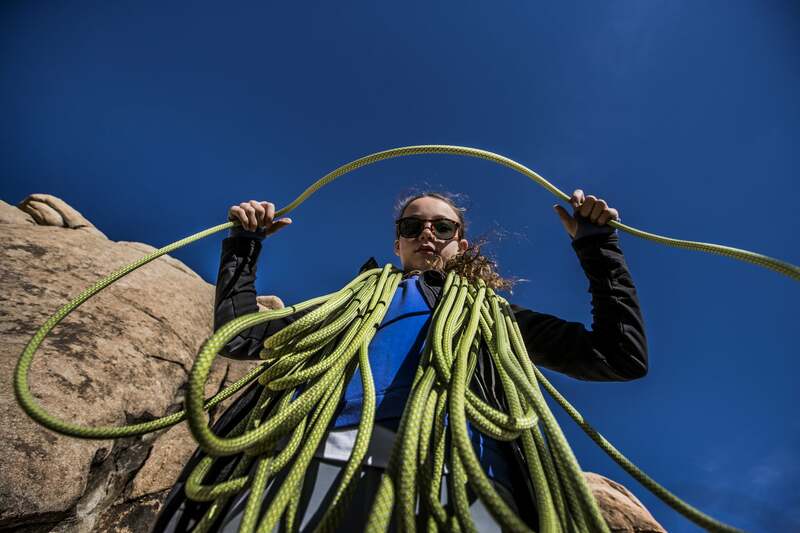 After being exposed to rock-climbing through GirlVentures, Gelbart got hooked. 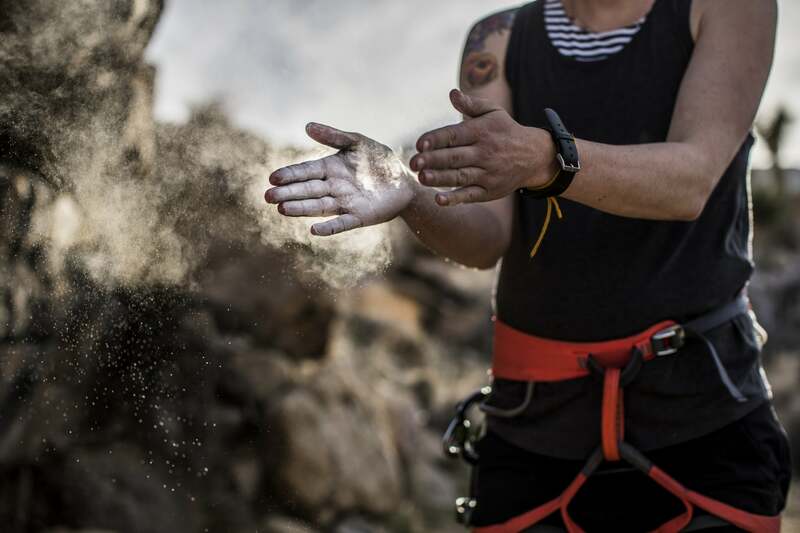 "Climbing became my way of life, my family, my sanctuary. It has made me strong, and I look at life through a new lens and live every moment in search of beauty and rich experiences." In May 2015, Gelbart was diagnosed with type-1 diabetes, but after recognizing her inner strength, she hasn't let it slow her down. Gelbert says she couldn't imagine battling the disease without the lessons she learned from her outdoor experiences. "Facing perhaps the hardest emotional and physical setbacks in my life so far, I threw myself more into climbing. In the last year, I have summited more mountains, learned to backcountry ski, and traveled to the Alps with the help of the American Alpine Club to pursue my dream climb." Gelbart credits GirlVentures for giving her an appetite for adventure. "When I needed it the most, I found the courage I needed to embrace life's challenges with the help of the outdoors." Elena Idell, 27, is another Project Courage alum. She says her experience with GirlVentures allowed her to realize the value of friendship, teamwork, perseverance, and stepping outside of her comfort zone. "These are all essential skills that I still use today." Idell says GirlVentures inspired her strong commitment to nature. "Over the years, I have worked as an outdoor teacher naturalist, camp counselor, and bike trip leader. I have traveled all over the world in search of seeing the outdoors from as many perspectives and in as many places as possible." She is now a second year law student pursuing a career in environmental law. "I am truly thankful for the opportunity that I had as an awkward middle-schooler to be challenged, to laugh, and to experience the outdoors in the best way possible with such a passionate group of people." Then there is Tsipora Prochovnick, 26, who works as a wilderness ranger. She too did the Project Courage program, at age 12, and says it gave her a sense of direction for her future and set her up for a career in the outdoors. "It was the nights spent sleeping under the stars, the friends I made. It was the experience of leading others my age and the challenge of trusting and following. It was the heights I reached rock-climbing and the sweat dripping off my chin while hiking. All of these things left me wanting more." The GirlVentures experience doesn't end when the trip is over. Not only do the participants have their courage beads and letters to themselves, but they also have a new community. "GirlVentures is not simply a challenging, powerful course that one day ends and you go back to your house to nurse your realizations and then quickly move back into the everyday pattern of your life," says Prochovnick. "GirlVentures is there for you. GirlVentures was there for me." Through its leadership progression model, the nonprofit provides returning students new challenges as they move out of middle school and through high school. Alumni like Prochovnick say GirlVentures played a fundamental part in their formation. 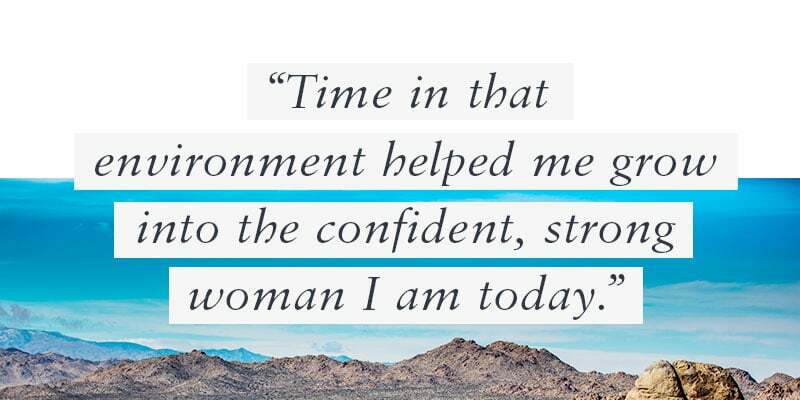 She sums it up: "Time in that environment helped me grow into the confident, strong woman I am today." 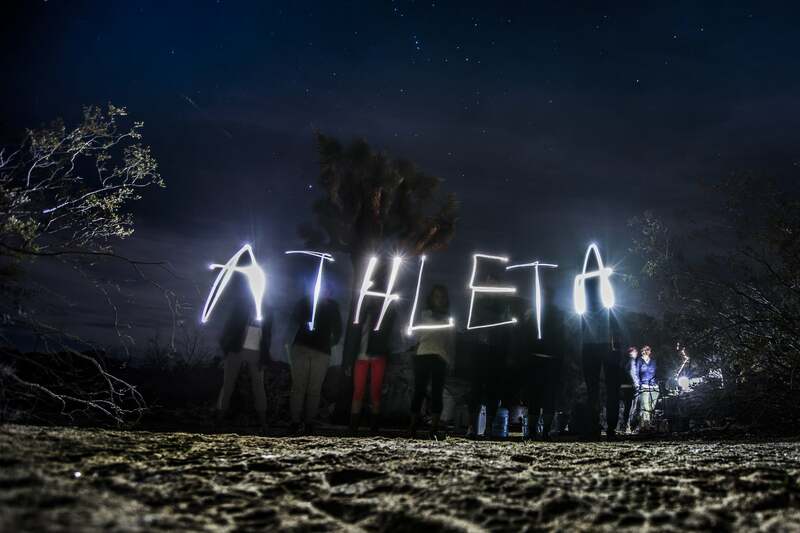 Inspired by what you've just read about Athleta's partnership with GirlVentures? Visit your local store to see how you can make a difference in your local community. And learn more about GirlVentures and what it does to empower women and girls around the world.